First Round : Chris Smith and Scott Verplank each fired a 6-under-par 66 to lead Jeff Sluman and Stuart Appleby by one stroke. Eleven players were two back of the lead. Second Round : Paul Azinger moved to 9-under-par 135 to lead Vijay Singh by one stroke. Smith, Tiger Woods and Sergio Gracia were tow strokes back of the lead. Third Round : Azinger was at 12-under-par 204. He led by one stroke over Woods and by three over Appleby and Garcia. Missed Cut: David Berganio, Jr. (74-74-MC), K.J. Choi (75-73-MC), Scott Dunlap (77-71-MC), Brad Elder (75-73-MC), Tim Herron (74-74-MC), Mikko Ilonen (78-70-MC), Trevor Immelman (77-71-MC), Jerry Kelly (75-73-MC), Scott McCarron (74-74-MC), Jack Nicklaus (75-73-MC), Don Pooley (73-75-MC), Tom Purtzer ( 75-73-MC), Chris Riley (72-76-MC), Jean Van De Velde (75-73-MC), Fuzzy Zoeller (78-70-MC), Olin Browne (73-76-MC), Steve Jones (75-74-MC), Frank Lickliter II (73-76-MC), Brett Quigley (72-77-MC), Jarmo Sandelin (72-77-MC), Hidemichi Tanaka (74-75-MC), Craig Barlow (76-74-MC), Jim Carter (75-75-MC), Michael Clark II (72-78-MC), Steve Pate (73-77-MC), Joe Durant (76-75-MC), Roger Maltbie (72-79-MC), Mark O`Meara (74-77-MC), Geoff Ogilvy (76-75-MC), Glen Day (74-78-MC), Chris Perry (77-76-MC), Kaname Yokoo (73-80-MC), Greg Norman (82-73-MC), Keith Fergus(83-76-MC), Stephen Ames (W/D). "Right now he is the most dominant athlete in sports." Former Memorial winner Paul Azinger's words on the man who outlasted him to win his record shattering third consecutive Memorial Tournament victory. 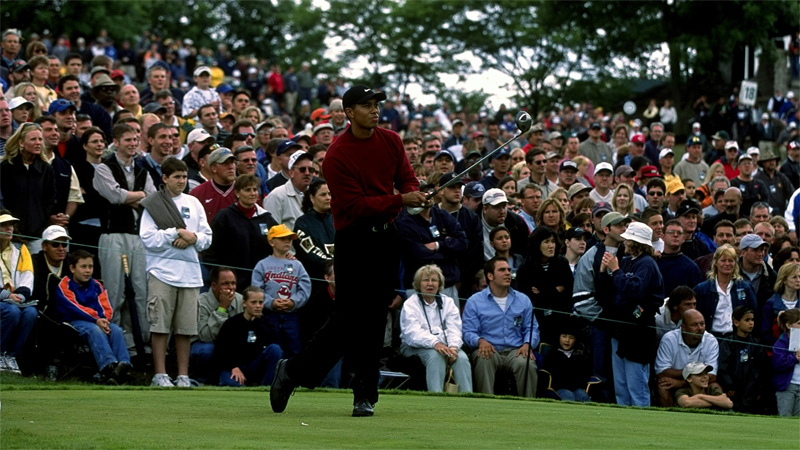 Of course Azinger was referring to Tiger Woods, whose mastery of Muirfield Village is unprecedented. No player had successfully defended at the Memorial, and only five have won it twice. Now Woods has won it three years in a row, the first golfer since Tom Watson in 1980 to win the same PGA TOUR event three years in a row. All the focus was trained on Woods coming into the 26th Memorial, not least because he was the tournament's two-time defending champion - the first to win back-to-back - and became its first three-time winner. Taking the week prior off, Woods flew into Columbus on Tuesday and made it to the course by the afternoon for a quick practice round. Right out of the chute, he'd birdie the first three holes. Benefiting Woods was the condition of the course: "Pretty much the same conditions he won it a year ago and two years ago," said tournament founder and host Jack Nicklaus. It rained more than six inches the previous two weeks. Woods eagled both par 5's on the back nine in the first round with iron second shots and single putts. His first eagle erased a double-bogey he's suffered on his third hole of the day. The second eagle headed him toward a four-under -par 68 that left him two stroked behind leaders Chris Smith and Scott Verplank at the end of the day. The wind, swirling, but mostly from a direction that much of the field had rarely experienced, helped create 10 other scores of 6 or worse on the same hole that grabbed Woods. THen, too, the greens ended up as slick as they had been in 10 or 15 years of the tournament, according to Bicklaus, making them equally unfamiliar to the majority of the players. Despite the conditions, Smith and Verplank each managed seven birdies that first day around a lone bogey. Seven tenths of an inch of rain fell before play the next morning, causing PGA TOUR officials to impose the lift, clean and place rule. That decision turned out to be a blessing a few hours later, when a heavier downpour suspended play for more than two hours. Vijay Singh, however, had no problem with the conditions, even after play resumed and an increasingly chilly, 1--to-20 mph wind appeared from a different direction than the rain. Flying it at the flag without fear of a bad bounce on the soft greens, he maneuvered through Muirfield Village without a bogey, birdieing 14, 15 and 16 to finish with a 66 and a two-round total of eight-under-par 136. That still wasn't enough to catch Azinger, however, who an hour earlier had been even better down the stretch with the wind at his back. After birdieing five house in a row, the 13th through the 17th, his seven-birdie 67 put him at nine-under 135. Asked if something beyond is control might be working in his favor, Azinger dismissed the notion. But Nicklaus, who played the first two rounds in a group with Azinger and Mark Brooks, was not as quick to do so. "I don't believe in fate," said Nicklaus. "I believe that good golf wins golf tournaments. But sometimes, a tragedy or a circumstance does affect your life and change things that happen." If some higher power was, indeed, steering Azinger's fate, it continued to influence it in a strangely positive way in Saturday's third round. More rain delayed the start until noon, then suspended it twice in the next four hours. As a result, the last group didn't tee off until 5 p.m., guaranteeing the round would not finish before dusk. Azinger recovered from a shaky start to make par on six, then did not miss a fairway after that, playing his last nine holes three under par on six, then did not is a fairway after that, playing his last nine holes three under par with no bogeys. That left him 11 under par when darkness ended his day after 14 holes, and with a two-stroke lead over Woods, Stuart Appleby and Sergio Garcia, none of whom finished the round either. When the third round resumed early Sunday morning, Woods birdied two and Azinger one of the four holes remaining, thereby halving the margin between them to one shot. Their closet pursuers, Appleby and Garcia, were another two strokes behind, and never would be a factor as the round progressed. After Azinger birdied number one, then Woods the second hole, they reached the par-5 fifth tee still separated by a shot. Woods launched his expected missile far down the fairway, while Azinger, hitting second and landing his ball well behind Woods', left himself 238 yards to the front of a green with a river of water gauging all of its left side and most of its frontal area. It was at that point that Azinger, with the wind at his back, made a fateful decision to go for the putting surface in two. He pulled his three-wood from the bag, hit the ball pure but a little too much left, and knocked it in the water. "It was probably a mistake for me to take a crack at that point," he said after the round. "I was one shot ahead, and my strength all week had been my wedge game, not my long game. Maybe I should have just laid back and played my strength." Woods, 249 yards from the hole, then played to his strength, hitting a superb 2-iron that stopped pin-high and six feet right of the cup. When Woods made his putt for eagle, after Azinger missed a 12-footer and bogeyed after dropping under penalty, the three-shot swing put Woods ahead by tow. His lead was never less than that the rest of the way. Woods shot 66 to finish with 17-under-par total of 271 and win my a tournament-record seven strokes. His score equaled the lowest closing round by a Memorial champion, and he became the first golfer since Tom Watsonin 1980 to win the same PGA TOUR event three years in a row. "To be able to put my name on that trophy three times is awfully special," he said later. Azinger finished second with a 74 for 278 and was able to laugh about it. In fact, he said he's apologized to Woods late in the round for not giving him a better game. "I was hoping at the end of the week I would believe in fate," he added. Woods played the par-5 holes to an average of 4.125 strokes that week. The field averaged 4.775. "Right now, he's the man." Azinger said. The most dominant man.